In Visual Studio, you can customize fonts, colors, menus, toolbars, window locations, and keyboard shortcuts, and you can create templates, use external tools, and manage extensions. 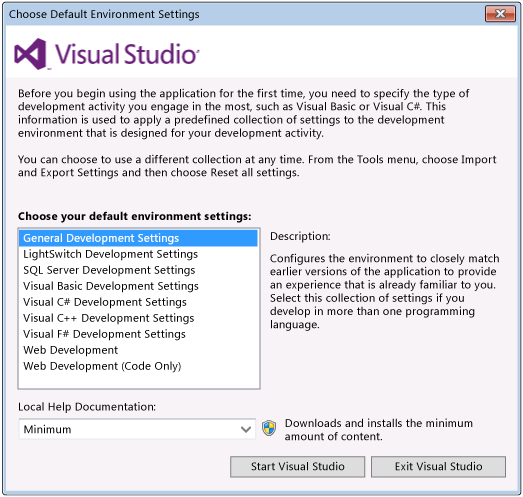 No matter how you customize Visual Studio, you can share your changes with others or even start over by reverting all settings to their default values. Your customizations persist after you close and reopen Visual Studio because they're automatically saved in a file, and they also apply to any computer in which you sign in to Visual Studio. See Signing in to Visual Studio. When you upgrade Visual Studio to a newer version, you can upgrade to a different edition of Visual Studio without any problems. The first time the new version runs, it will detect a previous version of Visual Studio and prompt you to import your custom settings. When you start Visual Studio for the first time, you specify the type of development that you do the most, and Visual Studio then optimizes some settings for that type of development. That choice determines the values of some settings, some of which you can't change without revisiting your initial selection. See Reverting your changes. If you want to customize Visual Studio at a more granular level, you can modify hundreds of settings in the Options dialog box. On the menu bar, choose Tools, Import and Export Settings. Choose the Reset all settings option button, and then choose the Next button. Choose the No, just reset setttings, overwriting my current settings option button, and then choose the Next button. In the list of collections, choose the collection that you want to use, and then choose the Finish button. To revert any customizations, choose the same collection that you already have. To change to a different collection, choose the collection that you want to use next. You can share your customizations by exporting your changes to a file that others then import. Choose the Export selected environment settings option button, and then choose the Next button. Make sure that the check boxes for the kinds of settings that you want to export are selected and all other check boxes are cleared, and then choose the Next button. Some settings may contain information about you or your computer. For example, if you have customized Visual Studio to save projects to a shared folder on your network, your settings file contains the path to that folder. If you export this file to share with others, anyone who imported your settings would also be pointed to this network share. A warning icon appears next to settings that may be risky, such as External Tools Lists and Command Window Aliases. (Optional) Name your settings file, enter a different path where it should be saved, or both. By default, setting files are named Currentsettings.vssettings and saved to %USERPROFILE%\Documents\Visual Studio 2015\Settings. Choose the Import selected environment settings option button, and then choose the Next button. Choose the appropriate option button to specify whether you want to save any of your existing settings, and then choose the Next button. In the list of default settings and setting files, choose the appropriate item, and then choose the Next button. In the list of categories, make sure that the check boxes for the kinds of settings that you want to import are selected and all other check boxes are cleared, and then choose the Finish button.